Compared to the Roadmap that we had set up last July, begrudgingly we have to point out that we are late. We are now evaluating the real impact this delay will have and decide what will be its dimension in relation to the initial expectations and this at the moment translates in a revision of some parts of our Roadmap. We have thought, for instance, to review some parts of our server that at the moment did not satisfy in full the Game’s needs and to insert some changes that will have to be performed after the release of the Closed Beta version. We are also evaluating a review of the Game’s rules that we would like to submit to you all. This in order to make it more captivating but also to increase the novelty of our mechanics, obviously maintaining a web oriented style of playing. 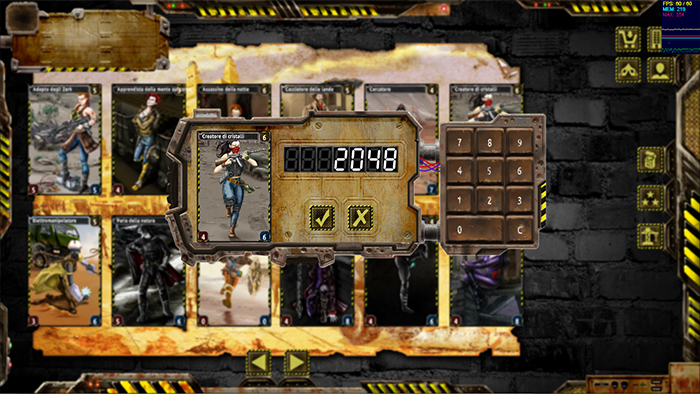 Today the mechanics of playing provides for a clash between Characters that face each other one time only assigning some score at the moment of victory of one of the two contenders [http://redevogames.com/2015/10/02/redemption-the-third-era-gameplay-iii/]. What we are now working on is a transformation of the mechanics of playing to make it more captivating ensuring that the Character that has possibly survived the clash could go on his own struggle against the next Character proposed by the enemy. This way the game will have a more strategic approach, the Skills to be used shall be selected in a more shrewd way and the Energetic Pool shall be better be accounted for. Furthermore our Characters skills could be more differentiated according to the various stages of the clash and could be more varied and interesting because they will present effects of getting in and out from the battlefield. Within next week we will be able to present you a final overview of the new Roadmap that will include the new expected dates for the release of the Game. In the following weeks we will be able to give you more specific data about the new game modes. One of our main shortcomings is our fussiness, we are very much alike the Damas in this matter, this brings us to lengthen the work times. Our playing cards are all born following the same ‘long’ procedures. We start from the idea of the subject to be featured, the Picture. All the data that pertain to him are inserted into a Format from the Creative Director (Silvia) that will then forwarded to the Illustrator. 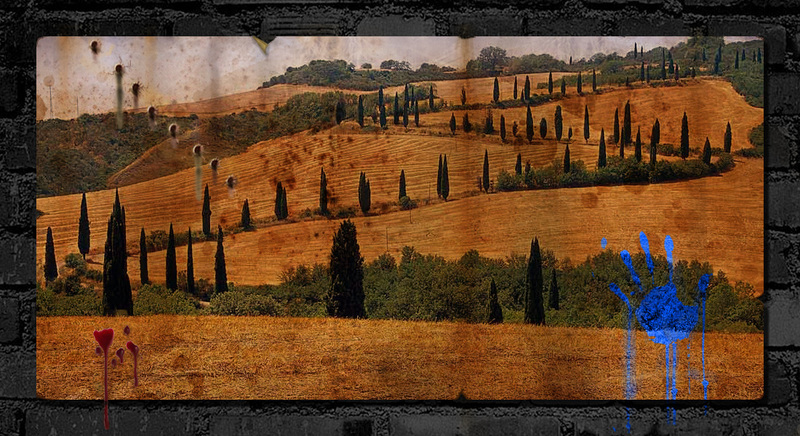 some technical details concerning the Picture’s file (dimensions, resolution, etc..). The Illustrator in addition to the Format also gets a detailed description of the somatic characters of the race Picture belongs to and a cut of the Backdrop where he will be position. Very often all this is accompanied by explanatory drawings that are used to create weapons or particular accessories. The Illustrator, after having received the material, starts working and prepare his first black and white draft. The Creative Director points up possible changes to be made, and the Illustrator starts to set everything up and to the final realization, after that everything will be coloured by a Colourist or by the Illustrator himself. When the Picture has been coloured, it comes back in ‘our’ hands for the second part of the procedure. At this point the adjustment phase begins. This will allow the Picture drawing to transform into a real Playing Card. The Picture is placed on the definitive Backdrop which is the same that has been given to Illustrator and Colourists, but in a higher resolution. In some cases the scene can change completely due to technical reasons or because, once the work on the Picture is over, it will fit other types of settings. During this phase our Main Illustrator steps in (Andrea, that also is the backdrops Illustrator) that having in front a complete Backdrop and a Picture, will work on them to adjust possible shadows, the perspective, light points and get everything together and more charming. In this phase too we reach the positioning of the Shell (that is the frame that surrounds the Playing Card). Despite the fact that all Illustrators and Colourists that work with us are very good, Andrea’s interventions are at times miraculous, because they are able to melt perfectly the Picture, the Backdrop and the Shell, thanks to an ‘overview’ that only someone that is well aware of the setting and of the world of Redemption The Third Era may have. The Playing card with its Shell, that is different if pertains to a Hero Playing Card or a Character Playing Card, now gets into the hands of the Rules Creator (David) who will insert the Basic Features and Skills of the Playing Card. At this point our ‘drawing’ has turned into a real Playing Card which is ready to face the testing phase that is used to establish if the inserted Skills have been fine tuned or need more adjustments. Regard to the game, we are taking decisions that will have a fair impact both on the work we are carrying on and on the game itself. It is so because, given that we are provincial artisans, we want to do things right. Finally we established basic features the game will must have at time of Closed Beta launch and those ones will be developed during this phase. Monthly ranking: each match that has been played in any unfriendly mode will earn points to the player. The players with the highest scores will be awarded on a monthly basis. Buddylist: management of the friends in the game. Creating a system of rewards within the Clan/Gang/Guild. Maybe these choices will impact on the dates of the Closed Beta outset. Any changes will be announced in later posts, as soon as we have evaluated the impact of these options on the development times. Character Cards have their own basic Characteristics and some ‘activable’ Skills. They belong to one Race and they may refer to one specific Corporation. The numeric values present on the Card have different meanings depending on the color of the ‘box’ in which they are placed: the yellow box on the top right represents the Fame of the Card, the red one on the bottom left represents the Strenght and the blue one on the bottom right represents the Constitution. Moreover, the number of swords showed on the Card determines the number of attacks the it basically launches during a battle versus another Character Card. 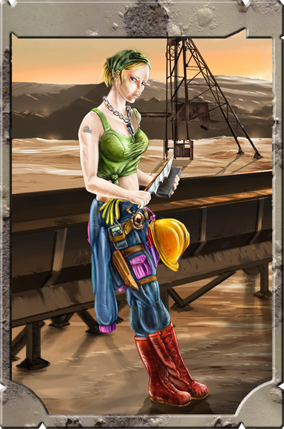 Skill: each Card has three Skills available and they can be activated if there is in Energy Pool the sufficient amount of energy to pay the price. Each value showed in the Card may be modified by both the use of the Eroic Skills and by the use of its own Character’s Skills. Obviously, the opponents too may interact in the same way with the values of the Cards. These events take place all in the combat phase. the increase in its own Characteristic or the decrease in a opponent Characteristic based on the number of similar components in the Deck: the Skill named Rain of Arrows will inflict the enemy’s Card an amount of damage equal to twice the number of Tamiaras in the battlefield. Next week, with the Gameplay III, we will speak about Decks and fighting dynamics during a match. 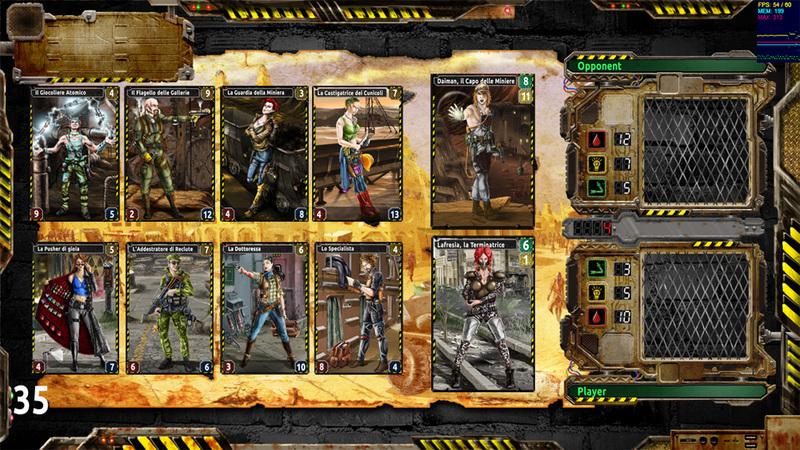 Cards are grouped into two big categories, Hero Cards and Character Cards. The main difference between these two types of Cards is the role they play in the decks creation: a deck can contain a single Hero, which has many functions and the main purpose of being the basis of the deck, and eight Character Cards. 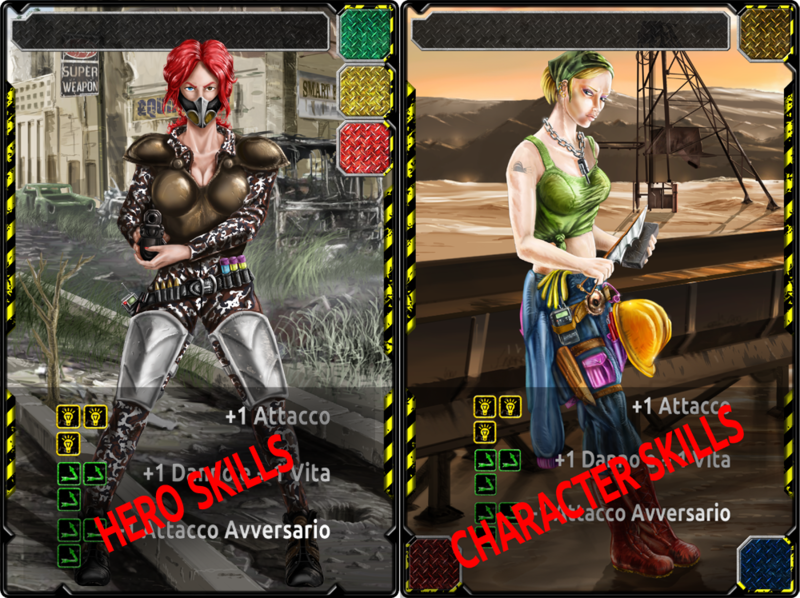 Each of these last has its own Features and Skills which, in the deck creation phase, have to be as much as possible in line with the features of the Hero in order to create possible synergies and winning strategies. 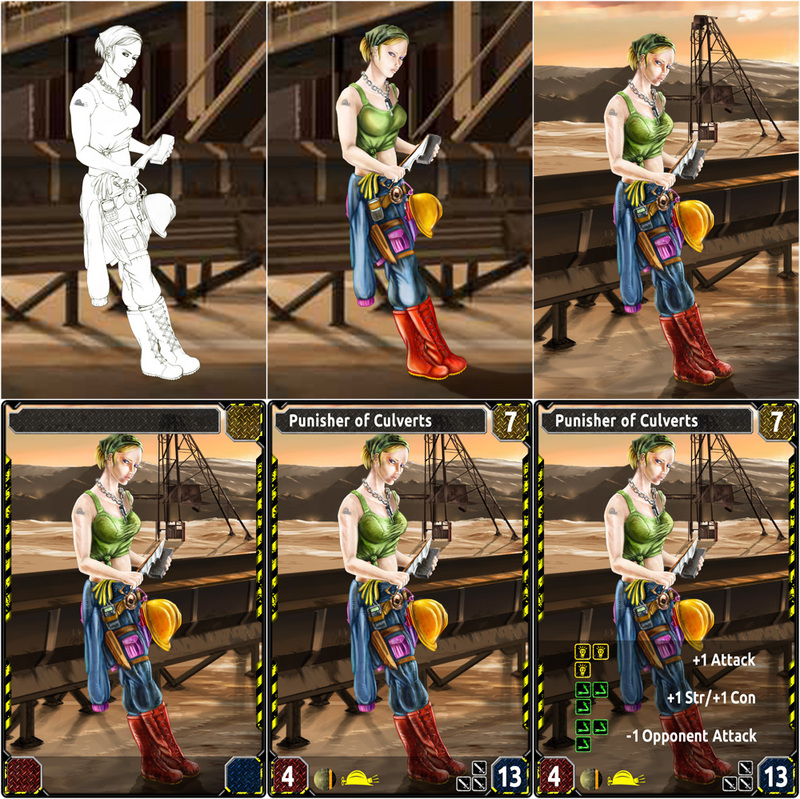 These different values of Energy are needed to enable the Characters’ Skills that are part of the deck. 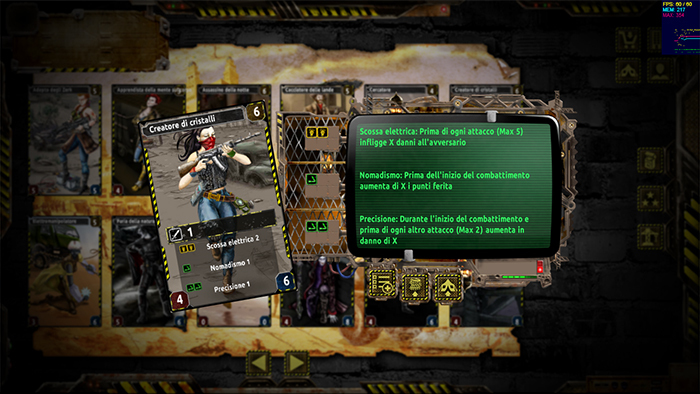 For each round of combat the Energy Pool is filled, starting from the basic Features of the Hero and adding up to the previously possible unspent values: the number in the green box represents the Movement, the number in the yellow box the Mental Energy and the number in the red box the Blood. It doesn’t mean that the three types of Energy belonging to the Pool are in full produced by each Hero, in fact the production of Blood, for example, is a prerogative of Vampires only. Heroic Skills: they have not an activation cost, but they become active if certain conditions occur during the match (for example a Heroic Skill can be activated if among the characters on the battlefield there are two or more belonging to the same Race of the Hero); each Hero has two Skills at its disposal. 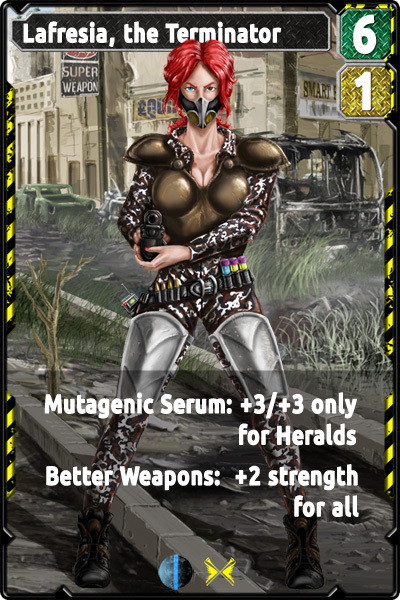 The Hero never comes into the fight, but he is the Leader of the group of Characters and he provides support to every single Card in each battle, either through his own Skills, both through the energy production that allows the activation of the Skills in the various Character Cards. 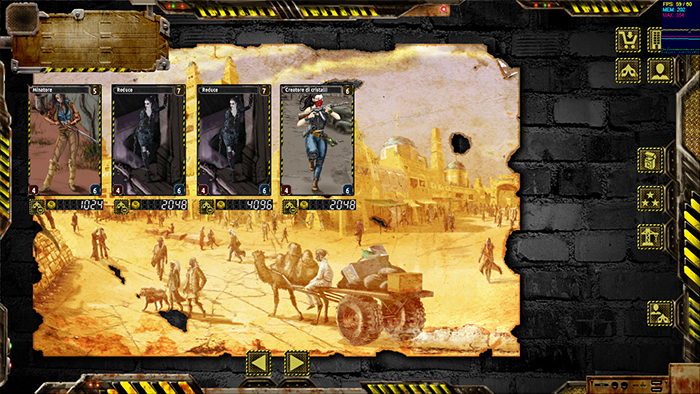 Regard to Redemption The Third Era, the Cards are grouped into two major categories: Heroes and Characters. They have different roles in both decks creation game itself. For example, the Characters fight each other and they have some Skills can be activated by the Player with a fixed cost while it is up to the Hero provide the required energy to pay the Skills activation by individual Characters. The Card consists of both the drawn Illustration and a Frame, the latter is different depending on whether it is a Hero or a Character. This difference is due to the need of representing several features that differentiate Heroes and Characters, moreover it provides the Player the means to recognize the type of Card with a simple and intuitive way. Because Cards are key point of the game we are setting up, all that is built in terms of both gameplay and graphics contribution, originate from, or is compared with them. This has led to a wide evolution of the Card and a lot of tries had led to build the current Frame. Regard to the Illustrations, they were drawn by different artists with the constraint of being realized following specific features suggested by the company and on a background which was provided from time to time. 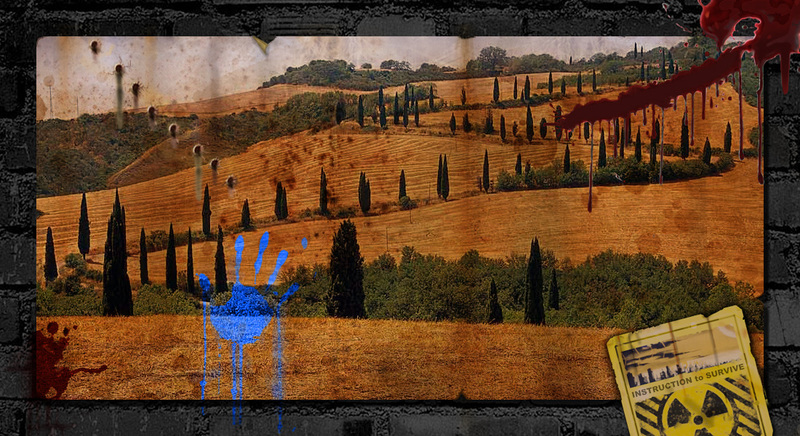 All backgrounds were made by Andrea, one of the project founders, and it allows to obtain Cards with different styles but associated by backgrounds realized by the same hand (as more specifically discussed in our post ‘The Style of Art’ of 22 May 2015 ‘link’). For the Frame, one of our main needs was to have a dominant neutral color that would fit each type of Card and each kind of the client background. 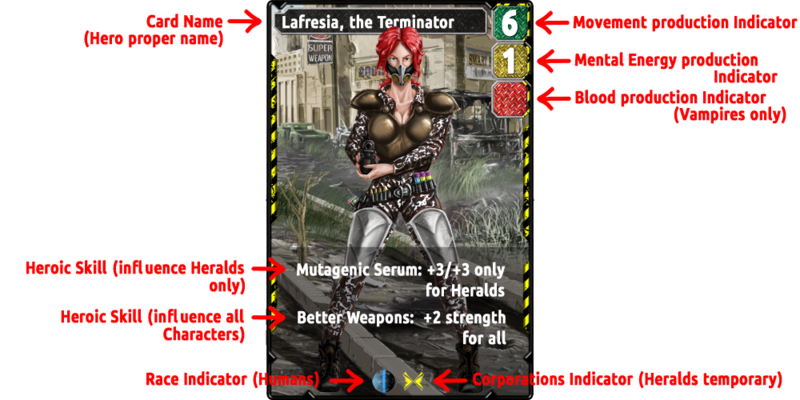 For this, we started from an unique Frame for both Hero and Character, with a very light color that vaguely could recall the texture of the rusty metal, but it resulted too imposing and it reduced the Card design itself. After this attempt, there has been a first revolution that has led to adopt also one of the typical features of the game that we are building, a characteristic alternation of black and yellow, as a representation of the radioactive danger. After a series of tries we have come to what we now consider the final Frames, one version for the Heroes and one for Characters. In both cases we have examined which features should be visible at a glance and which ones should be instead subject to a deeper investigation. We were looking for a balance that would be suitable for both experienced players and novice players. This is also why we have different levels of Frame: one with the minimum information necessary to recognize and use the Card with a single glance, and one that include the availability of names and costs of the Skills. 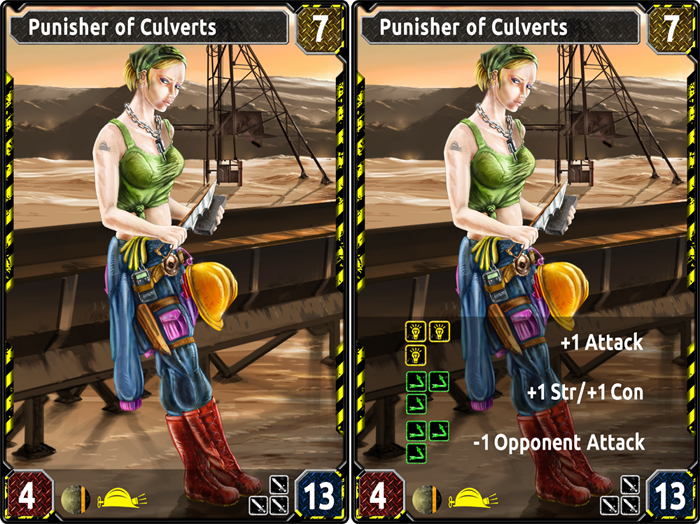 During the building of the various game screenshots, we realized how sometimes there has been the need to have access to the Card in its entirety and without mediations. For this reason we have created a system that allows an improved viewing of Card and its Skills, embedding the Card itself. We have made it inspiring to the Damas technology that mix a number of electronic components to a number of old style analog components. Their technology involves the use of screens with the ability of displaying written signs but, for example, they do not allow the insertion of images or other colored elements. To overcome this we have created a superstructure that contains the screen, so creating a system that allows you to display the cost of each Skill of the individual Card and the explanation of its functioning. 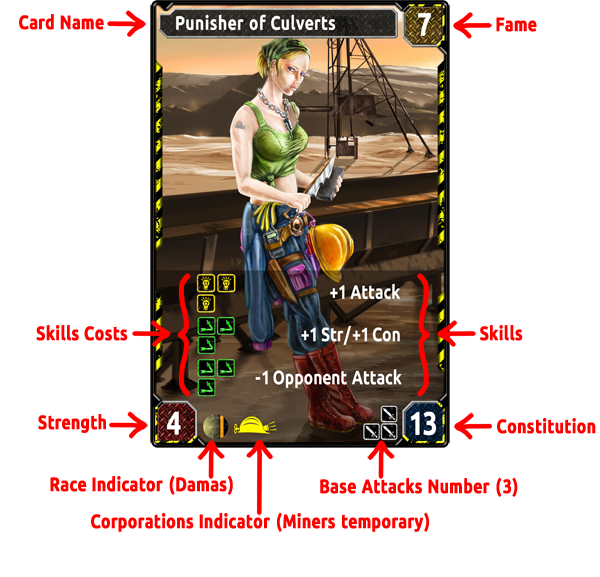 The next post will be still centered on the Cards and how they impact on the gameplay, in the meantime we leave you with some of the tries we have done over time before we get the final Frame … a little bit of madness does not hurt! 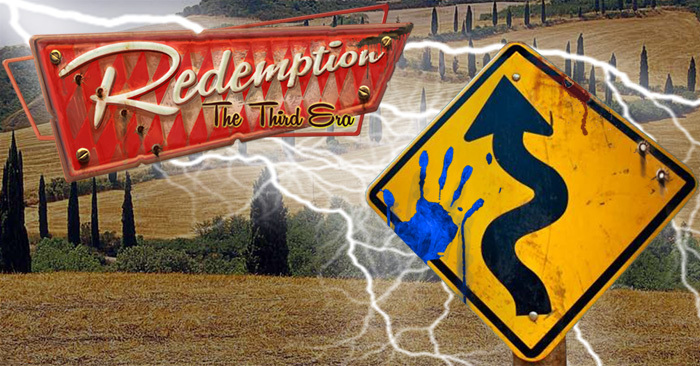 Contrary to the current trend of such games, Redemption The Third Era will include the Secondary Market of Cards, which is a way that will allow players to buy and sell the cards they wish both to enrich their collection and improve their decks. The market will be characterized by a very simple policy: each player will be able to sell his own card at a certain price. This will allow the bid to be launched on the market and to be compared to the other ones concerning the same card. buy a card from the market. Because the market is managed by Salk people, traders par excellence, they will withhold a small commission, between 2% and 5%, for each successful sale. We consider the market a very important part of the game. 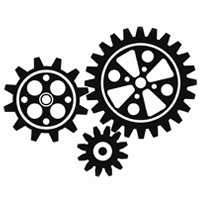 Following the market and understanding its trends and dynamics will be integral parts game components. They will not be essential, but they will permit you to exchange your own cards with different others in order to test various gaming solutions. At the same time you can enlarge your own collection by exchanging any excess cards with the most widespread currency in the postatomic lands of the Third Era: the caps, namely the bottle caps. The Sale and Purchase features of the cards are here described with pictures. 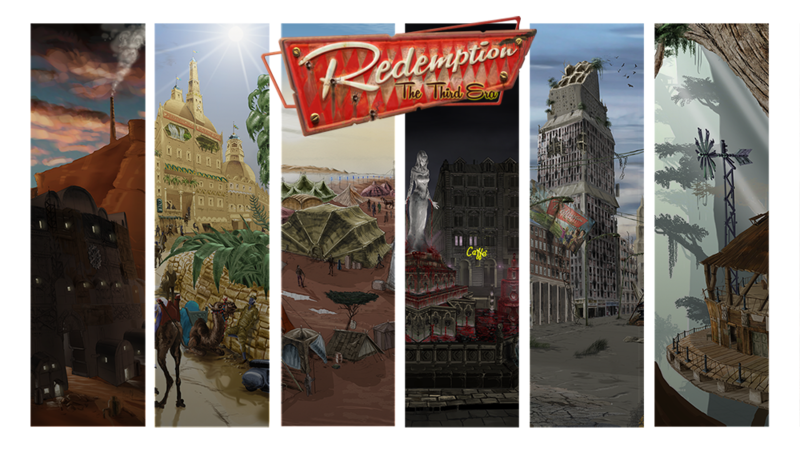 It ‘s time to share with you the Roadmap that will lead to the launch of Redemption The Third Era. This Roadmap is the current one, but it is constantly changing. For this reason we will make regular updates with other posts in our blog. We just want to let you know the progress of the work so that you will be ready at the time of the closed Beta release. Last week of August: End of the engine basic developments for client fullfilment. First week of September: Finalization of the Market development. 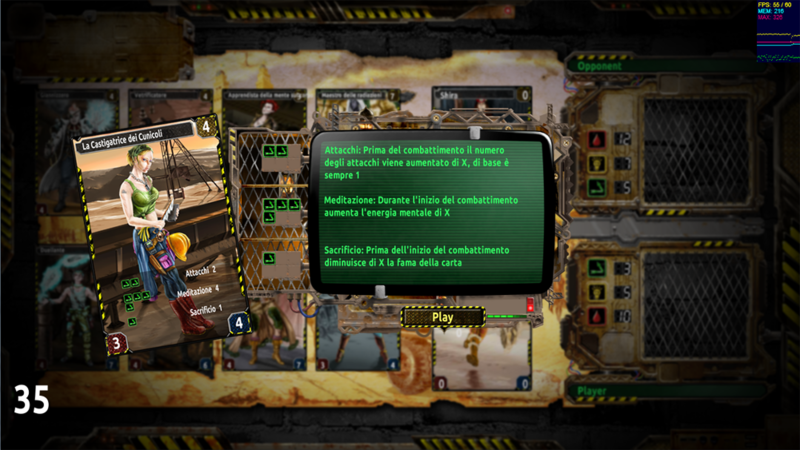 Second week of September: Finalization of the Deck Building system development, starting development of the Shop. Third week of September: Development of HUD and start of News System design. Last week of September: Closing work of graphic production of the cards. 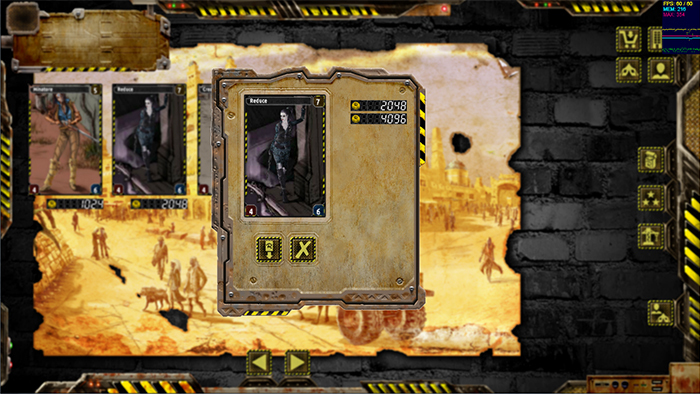 Starting work on cards graphic integration in the game. First week of October: Finalization of the Match development. Start of News System development. 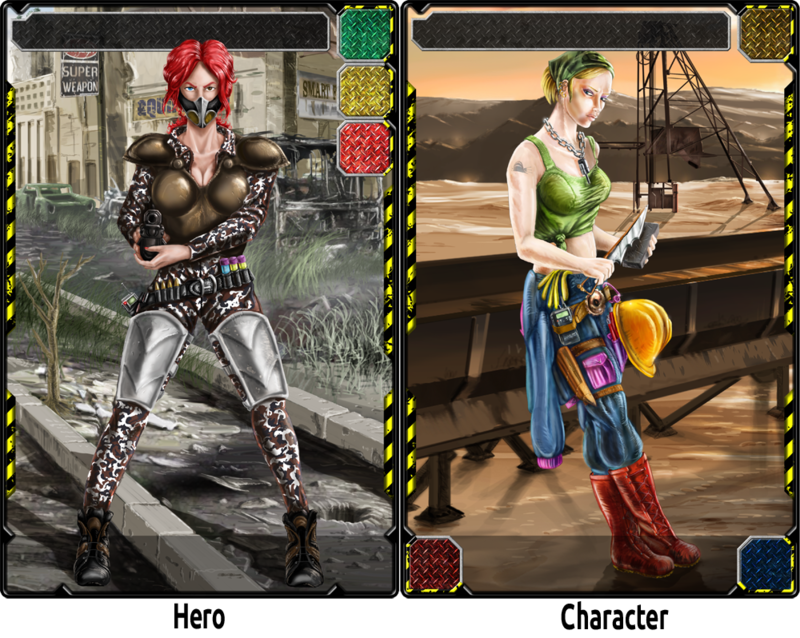 Second week of October: Start of Cards calibration procedures; start designing the Game Modes. Third week of October: End of Shop and HUD development. Start of integration with Facebook to login and post. Start integration with the PayPal payment system. Fourth week of October: Start Gameplay development. First week of November: End of the HUD and News System development. Second week of November: End of the Shop development. 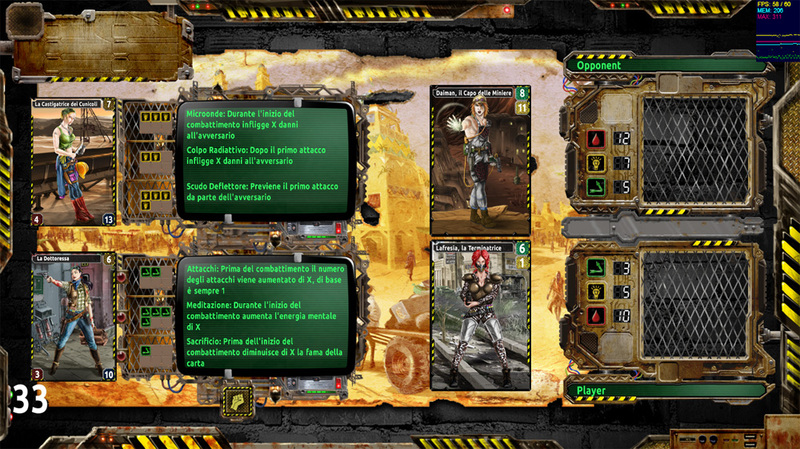 Finalization of the integration work of the card graphics in game. Finalization of the integration with Facebook and PayPal. Third week of November: End of the Gameplay development. Fourth week of November: overall Revision of the developments. First week of December: overall Revision of the developments. Second week of December: first calls for participation in the closed Beta will be sent. Third week of December: Start of the closed Beta. January: For the month of January, we foresee development activities of additional features to be tested during the closed Beta and the bug fixing. In this month we will also make the necessary adjustments for the publication of the game on Android and iOS platforms.